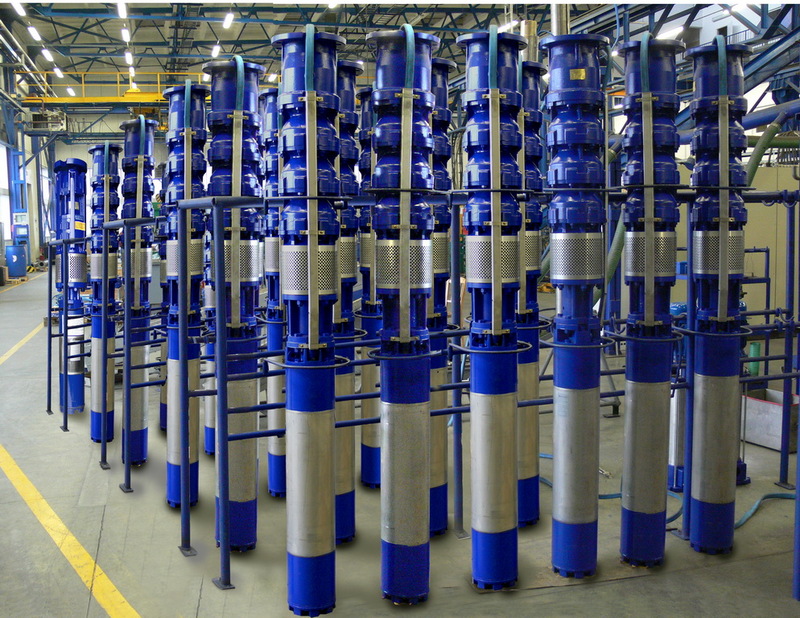 Deep-well units are designed for use in water supply systems, for pumping and increasing liquid pressures in technological processes, reduction of ground water level, watering systems, and other industrial and residential applications. 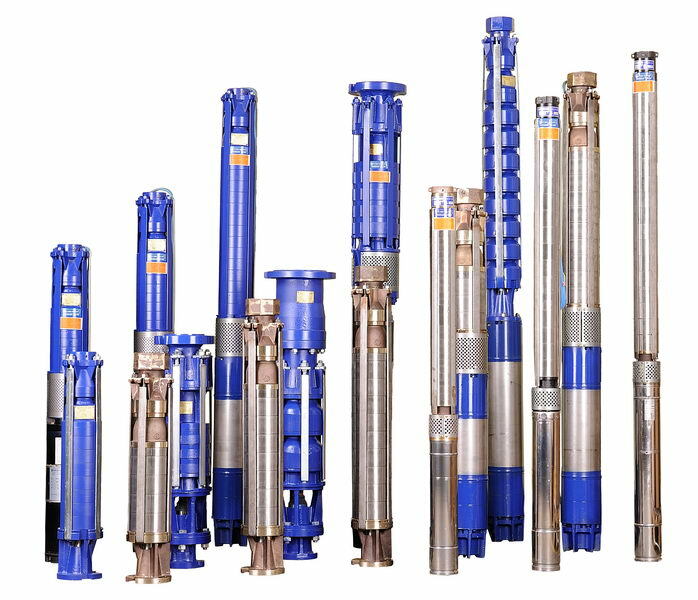 Deep-well pumps are designed for use in handling raw or treated potable water, sea water, as well as for mineral and thermal applications, with no long fi bers or abrasive content. Mechanical impurities in the liquids handled may be up to 100 mg/l of water; for pump units where impellers and stators are made of plastic, they may be up to 50 mg/l of water. Impurities that might cause creation of deposits in the pump and on the motor are inadmissible. If this is unavoidable, the deposits of 0.5 mm maximum must be removed. Liquids liable to cause accelerated corrosion or erosion of the pump construction materials must never be used. Liquids other than water may be handled subject to manufacturer’s approval. 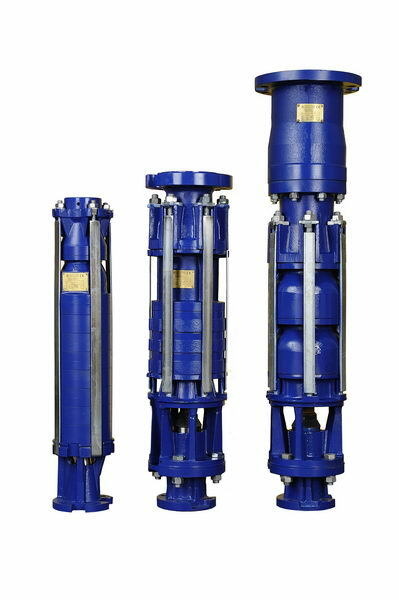 Deep-well pumps manufactured by Hydro-Vacuum S.A. are fi tted with wet-type submersible electric motors. Other types, ones having a fl ange connection and dimensions according to NEMA, may be used, if required. the frequency converter ought to be supplied strictly in accordance with manufacturer’s requirements, specifi cally those in respect of feeder-cable cross-sections and keeping the permissible distance between the frequency converter and the motor. For details of the cooperation between deep-well pumps and frequency converters please contact our Technical Advisors Department. for handling liquids other than water please contact the manufacturer: handling liquids of which the density and viscosity are higher than those of water will cause an increased requirement for power at the pump shaft , therefore, a motor with a higher power output has to be used. 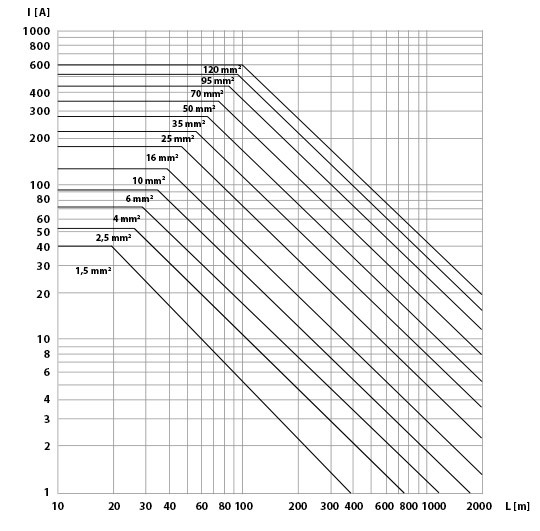 In certain situations, the duty point required may be located between the nominal characteristics of the succeeding pump type dimensions. Th erefore, intermediate characteristics, obtained by the nominal impeller trimming, are introduced in GC, GD and GF deep-well pumps. 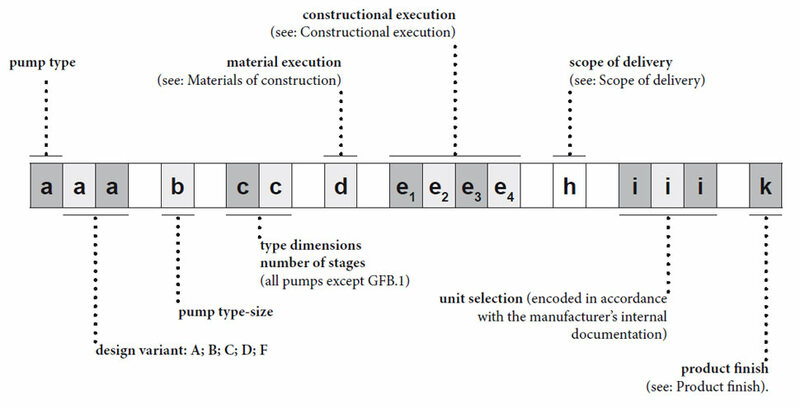 In the GC and GD pumps having up to 9 stages, the succeeding trimmings are denoted by the letters A, B, C… and in the GF pump the succeeding impeller trimmings are denoted by the digits 1 to 5. Th is enables an optimized selection of the pump unit to match the required operating parameters, reduces power requirement on the pump shaft and enables a motor with a lower nominal power output to be selected. If you are interested in pumps with more than 9 stages and having trimmed impellers, please contact the pump unit manufacturer. It is recommended to select pumps for operation in their high performance range for a more economical operation and maximized service life of the pump unit. Th e pump unit may not be operated with the valve on the discharge pipe closed because the absence of fl ow past the motor makes it impossible to cool it. Th e recommended minimum pump capacity is not lower than 0,2*Qmax. 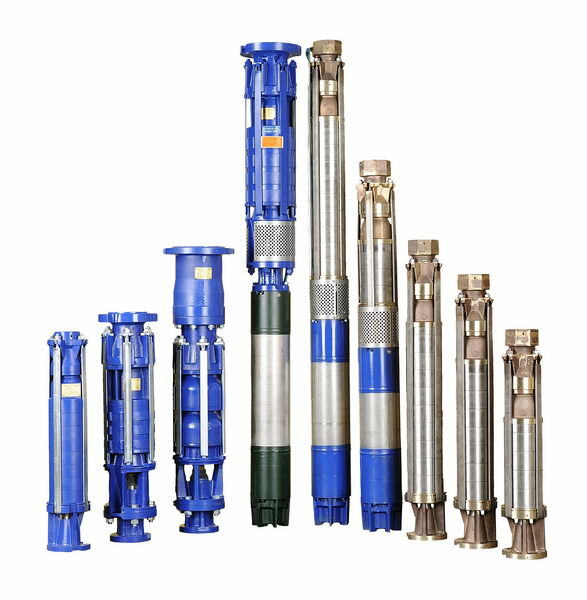 Deep-well pumps are a multistage type of pumps, constructed in series. Th ey are installed on submersible motors, therefore, they are also referred to as submersible units. Th e pumping unit is installed vertically, with a submersible motor located at the bottom and the deep-well impeller pump. Th e suction casing, protected with a sieve fi lter, is installed straight on the motor. Th e specifi c pump stages are installed aft er the suction casing. Each of them comprises the casing and the stator fi tted in it, and an impeller (radial or diagonal type). Th e pump is closed with the non-return valve housing and the discharge casing to connect the pump unit to the discharge pipe using either fl anges or a threaded connection. A coupling is provided to connect the rotating parts of the pump and the motor shaft . Distance sleeves are provided to correctly position the impeller in the stator and pump casing. 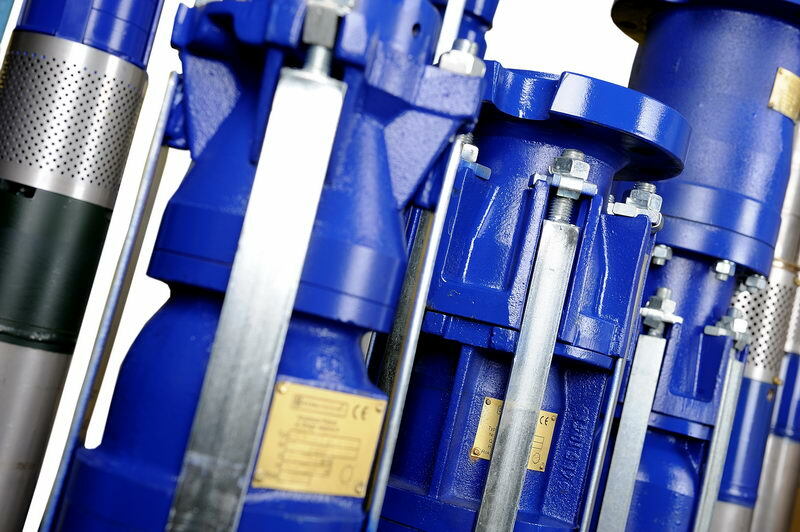 Th e rotating unit of the pump has steel-and-rubber bearing bushes. double-nutted bolts (the GDB, GDC and GFB pumps) - individual stages. fast and simple assembly and disassembly. 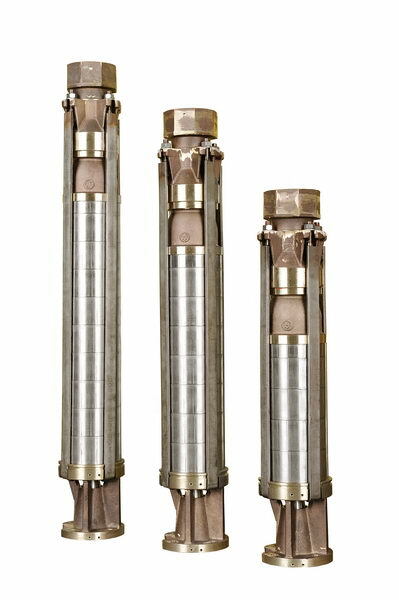 Deep-well pumps have been manufactured by HYDRO-VACUUM S.A. since 1939. Experience and ongoing improvement eff ort have resulted in a series of deep-well pumps of which the operating characteristics and service life are comparable to those of European products. Th ey are used in a number of applications all over Poland: in municipal drinking water systems, in villages, in housing estates, in farming and gardening. Th ey proved very well in tests and have been operated on a regular basis in the brown coal strip mine in Bełchatów and Konin (Poland). At present, they are used in other strip mines and in the construction industry, where low subsoil water levels are required in deep foundation trenches. Pumps from version 1, 2, 4, which should have connecting elements (bands, washers, screws, nuts) made of stainless steel then version 6, 7, 8 should be indicated. In case of pumps with 2, 4 versions only then version 7, 8 should be indicated. pump to e1 = 1 motor with a leak valve e2 = 3, threaded outlet e3 = 2, e4 = 0 is reserve. All essential information about the pump is encoded in its designation. Th e function of the designation, provided both in this catalogue and on the pump data plate, is to help make the right choice of a product and to keep in touch with us during its operation, for instance, when ordering spare parts. Type GCA.6, pump, two stages, in material execution - 2, 6” motor, hermetic valve, fl ange type outlet, scope of delivery - 4, unit selection 232 (according to manufacturer’s internal documentation), standard fi nish (protective coating). the diagram 2 and Table 2 for star-delta starting motors (See Page 9). For temperatures above +25oC, the selected feeder cable cross-section should be adjusted with regard to the cable current load limit, based on tolerable current loads given in Tables 1 and 2. A cable cross-section of 35 mm2 with 2.5% voltage drop is the right choice. 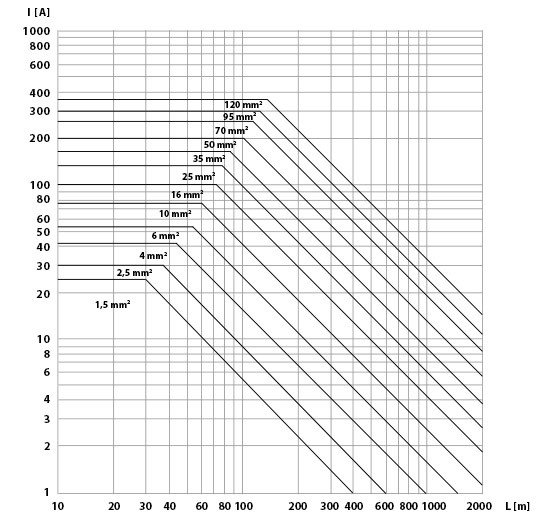 For a temperature of 45oC and cable cross-section of 35 mm2, the tolerable maximum current load for a 3-wire cable is 120 A according to Table 1. Th erefore, the cross-section above is suitable and suffi cient. Th e current load is checked for nominal current rating In = 100 A according to Table 1. For a temperature of 30oC, the tolerable maximum current load is 128 A. Th erefore, the cable cross-section above is suffi cient. Th e data in the table below are based on Order 29 of the Ministry of Mining and Power Industry dated July 17th 1974, and VDE 0298 for cable temperature limit of 60oC. Voltage drop 3%; ambient temperature 25oC; cosø = 0,85. 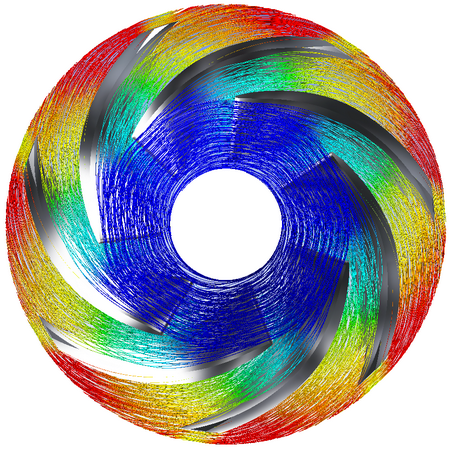 NOTE: For Vcalc < Vreq, a suction jacket is required on the motor, of which the inside diameter suits the desirable rate of flow past the motor. Th e pressure loss data above are specifi ed for a 100 m straight section of pipework. For elbows, T-pipes, non-return valves or cut-off gate valves, a length of 5 m is added to the straight section of pipework for each of the above elements.